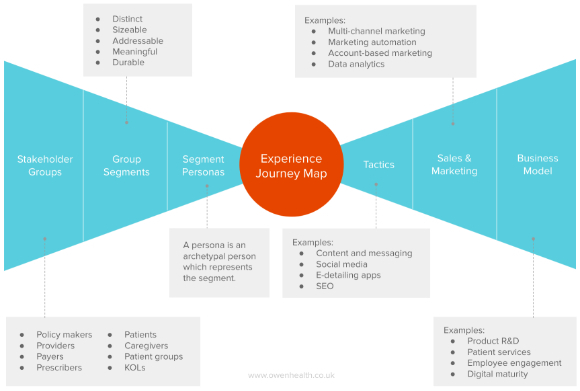 Customer-centricity and patient-centricity is no longer enough for pharma sales and marketing strategies as digital promises better customer experiences for all pharma stakeholders. Being customer-centric has become recognised as the only way for any business, in any sector, to survive in this customer-powered environment. In fact, being fanatical about customer experience has been the key to success for many start-ups that have disrupted their sectors, including AirBnB, Uber, Spotify and Stripe to name a few. The pharma sector has started to embrace this thinking, and some pharma companies now appreciate that activities such as market access strategies, defining customer value propositions, multi-channel marketing plans and digital tactics will be more successful if they are customer-centric. However, with so many stakeholders, it’s not always clear who the customer is. Is it the HCP, the payer or the patient? Well, although they all may not strictly be customers, it’s crucial that they all have a great experience when dealing with your products, brands and employees. In fact, it’s critical that all stakeholders, including policy makers, providers, patient groups, KOLs and caregivers, also have a great experience. Therefore, we believe pharma now needs to evolve from being customer-centric to being stakeholder-centric. So, read on to find out how to become stakeholder-centric. The first step is to ensure you have identified all the stakeholders. It may be appropriate to segment some of the stakeholder groups into a number of smaller groups. However, if you do remember to ensure all segments are distinct, sizeable, addressable, meaningful and durable. After segmentation, the next step is to develop personas. A persona is an archetypal person who represents the segment. Depending on the group it may be necessary to develop more than one persona for each stakeholder group or group segment. Next is the process of developing a journey for each persona. 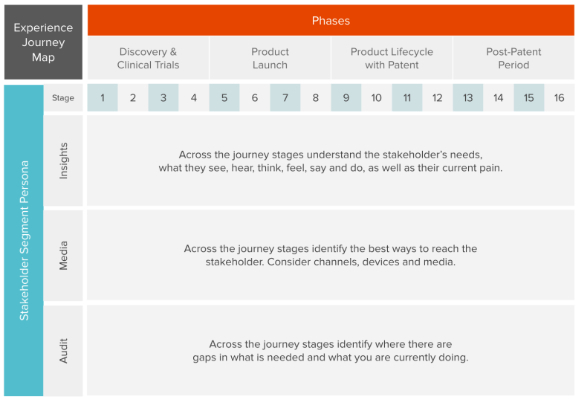 These journeys need to be comprehensive, so they’ll need to cover every phase, from clinical trials through to product launch and from product lifecycle management through to the product’s post-patent period. Define the discrete relationship stages with the stakeholder across each phase. With these defined, the stakeholder’s current journey can now be brought sharply into focus through insights about their needs, their experiences, their influences and the media channels they use. And finally, conduct an audit to identify how you are currently meeting, or plan to meet, the stakeholder’s needs and expectations. With the experience journey map created it can now be put to work in informing what you do. The use of these maps can be strategically dialled up and down. For example, it could help identify where a digital tactic could be put to use for HCP detailing, form the foundation of a multi-channel marketing plan, provide insights for the development of a market access strategy or identify a patient service opportunity. Regardless of how the stakeholder experience journeys are ultimately used, you can be confident that you’ll be enhancing experiences, becoming stakeholder-centric and reducing the risk of being disrupted by the next Uber.